Soda bread farls are flat breads that are made from the same dough as Irish soda bread, but are cooked in a skillet or on a griddle. They’re triangular and made by shaping the bread dough into a disc and cutting it into quarters before cooking, then cooking each piece individually. The idea is that it is easier to whip up a bread at a moment’s notice if you don’t need to use the oven. 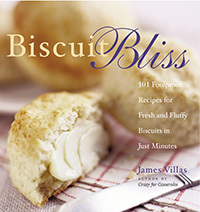 These breads, cooked in this style, are also known as skillet scones, since they tend to look (and taste) like scones. 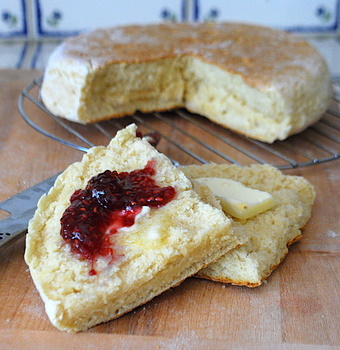 Like scones, they should be served with butter, jam, cream or any other topping you can think of. The name might not ring a bell to some, but it’s actually a pretty common food to encounter if you ever spend some time camping and swapping campfire recipes with other travelers. Just about all camp cooking is done in a skillet, so skillet scone recipes can be quite popular. The dough is very easy to make, with just a few ingredients: flour, buttermilk, salt and sugar. The sugar can even be omitted if you want a very plain bread, even though there is only a small amount included. While it’s traditional to cut up the scones and the farl dough before cooking, I find that it is much easier to cook the dough whole and cut it up once it is done. This makes it much more tender and moist inside, whileÂ the smaller pieces can sometimes dry out as they cook. It is also a little easier to tell when the big bread is done, as you can easily press the sides to see if the bread springs back into place before taking it from the heat. It takes about 8-10 minutes on a side, and the only thing you need to look out for is over-browning should your pan get too hot. Medium-high heat generally works the best. The finished bread has a good buttermilk flavor and there is just the right amount of salt and sugar to make it interesting. It is a little on the dense side, like all soda breads, but has a nice tight crumb and a relatively tender crumb. The top and bottom crusts turn out to be crisp when the bread is fresh and make a nice contrast to the moister, softer interior. I think the bread is best on the first day, but if you store it in an airtight container, it’s still good the second. Usually if I have leftovers, I end up slicing the bread in half crosswise and toasting it before eating. Preheat a dry skillet or griddle over medium-high heat while you make the dough. Combine all dry ingredients in a large mixing bowl, and whisk to blend. Stir in buttermilk, forming a sticky dough. Turn dough out onto a floured surface and gently knead until dough is no longer sticky and fairly smooth (about 1 minute). Shape dough into a ball and press it out into a disc about 1/2-inch thick. Transfer dough to skillet and cook for about 8-10 minutes, until bottom is golden brown. Turn dough over, and cook for another 8-10 minutes until bottom is golden brown and bread is set. Check for doneness by gently pressing the sides of the dough to see if the bread springs back into place. If not, reduce heat slightly (to prevent over-browning) and cook for another 2-3 minutes. Bread is best when it is fresh. That skillet scone looks delicious! A great speciality! I’ve never made a skillet scone. Can’t wait to try it! I had an oat farl whlist in ireland. this makes me salivate over the memory. they’re delicious! Those skillet cones…oh my God, they look fantastic. I will be making those. Man, these look fabulous. Happy St. Patty’s Day!! What a perfect recipe to celebrate such a neat holiday! Hiyas! Soda farls are a traditional regional food in Northern Ireland. Usually they’re made with whole milk rather than buttermilk, however. While butter and jam are very nice on a soda farl, the BEST way to eat one (though not necessarily the healthiest) is to cut it crossways, fry the cut sides in a little bit of butter, and then serve it as a sandwich with crisp bacon (or sausages) and a fried egg. Oh my goodness, thank you for posting such a fantastically easy (and delicious-looking) recipe! As I get to the end of my junior year of college, cash is running low, but I still have all my basic baking stuff. You’ve just given me about 2 weeks worth of inexpensive breakfasts! And I couldn’t be more thrilled. This looks delicious, and if I didn’t have half a loaf of soda bread already sitting at home, I’d be making it straight away! I have made these three times since finding this recipe. My husband absolutely adores them and not having to use the stove tells me these will be a staple in my kitchen for the rest of my life. There are soooo many things you can do with them. I love them. I read your blog all the time but this was so simple and so good I had to say something. I love this recipe, but have a quick question. If it is supposed to be soda bread scones, how come the recipe calls for baking powder? Is this a typo or correct? Thanks for the info so that I may try these. OK, the first time I tried this recipe, it failed miserably. Burned well before 10 minutes were up. My fault for not staying on top of it. I’m eating my second attempt now, & though I warmed the griddle on medium heat I turned it down to very low heat once I started smelling the farl. Never got it above low with the bread in the pan. I imagine the difference is that I cooked it on a cast iron griddle rather than normal. wow…i would love to have this serve together with my coffee.. thanks for sharing this wonderful recipe! Like the idea that there isn’t butter in this recipe! Yerp love the recipe, totally can’t wait to try it, I’m sure I will. Yummikins! I just whipped this up using Chobani plain nonfat greek yogurt and a splash of soymilk, along with rubbing cornmeal on the outside, and it still turned out yummy. I made it a little too thick, but I reduced the heat and cooked it longer, so it came out okay. Great recipe! Served this to company tonight. I needed a last minute side to my casserole and didn’t want to heat the kitchen for biscuits or muffins, so I searched for something in a skillet. Wonderful recipe. I must admit to having a bit of an issue getting the heat regulated but once I did they turned out GREAT!